GroupTweet is the perfect way to allow multiple contributors or team members to help you Tweet from one or more Twitter accounts. We put together this step by step guide to walk you through how GroupTweet works once you’ve connected your Twitter account with GroupTweet. Check it out, it’s magic. 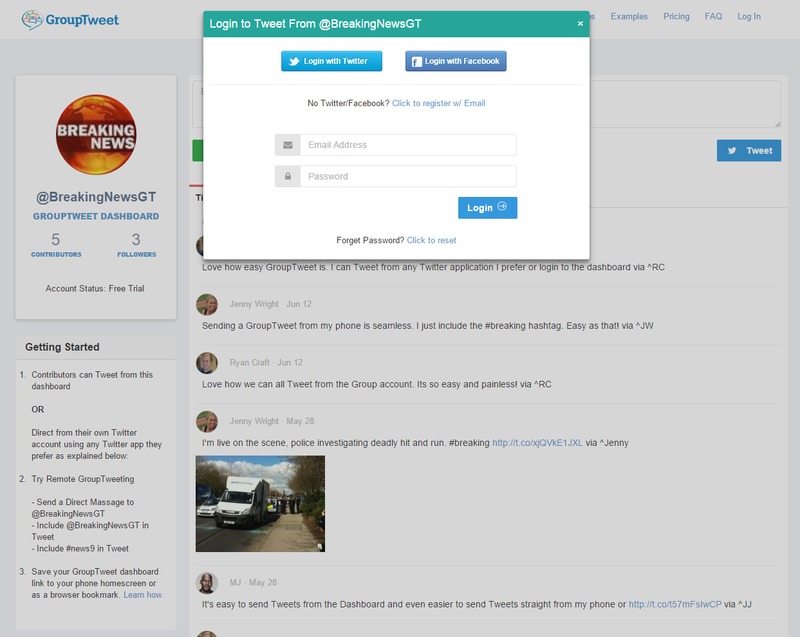 To see the instructions on how to first create and connect your group/company account with GroupTweet, click here. 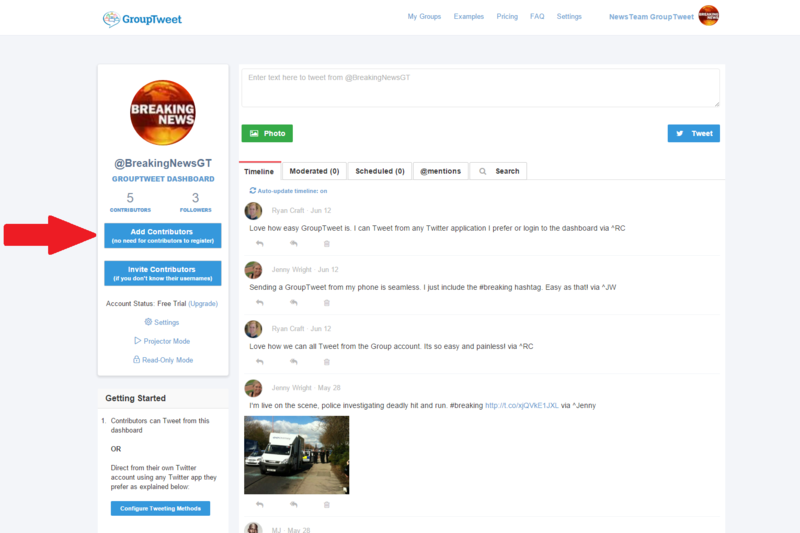 For demonstration purposes we’ve created Twitter accounts named @BreakingNewsGT and @WidgetSalesTeam and connected both with GroupTweet. Once you connect your group’s Twitter account with GroupTweet you are directed to the GroupTweet dashboard which you see below. The first step to getting started is to add one or more contributors to your account. The link to add contributors is highlighted by the red arrow in the screenshot below. Clicking the “Add Contributors” link brings you to the GroupTweet settings menu. A great way to test things out is to add your own personal Twitter account as the first contributor. As you can see, I’ve already added several contributors to the @BreakingNewsGT account. On this page, simply enter the names of your contributors Twitter usernames. If you have too many to list or you don’t know their Twitter usernames, you can simply send them your group’s invite link and they can register as contributors by clicking your link and logging into GroupTweet with their own personal Twitter account (or e-mail address). If you list their Twitter usernames, this will save them time since they won’t have to register with GroupTweet. If you want to create an entirely crowdsourced Group Twitter account that can be open to hundreds or thousands of contributors, you can select the “Yes” radio button after the question asking, “Do you want to allow any Twitter user to Tweet from @BreakingNewsGT? Adding contributors through GroupTweet allows them to Tweet from your account without ever needing to know your account password! Once added, contributors can either login to your GroupTweet dashboard or send Tweets directly from their personal Twitter accounts. If you send them the invite link to your dashboard, they will see the following. The Dashboard is simple. 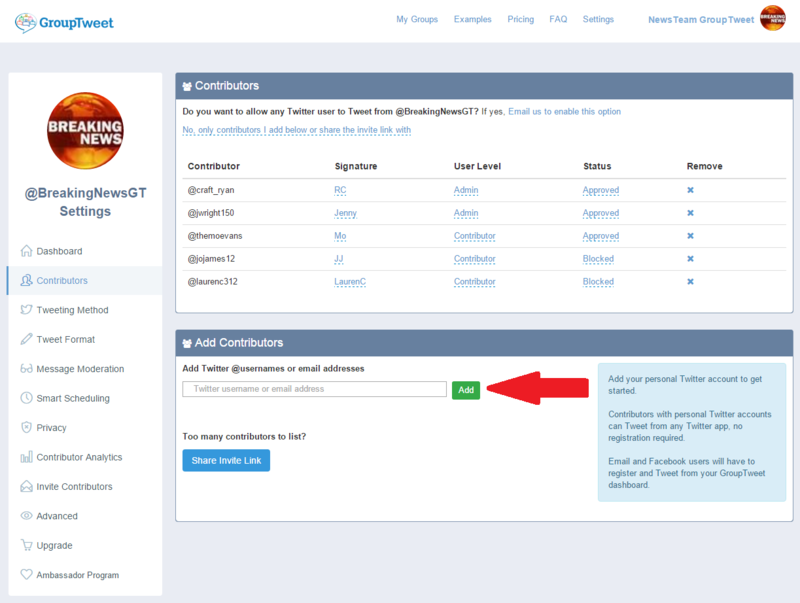 You send desired contributors your GroupTweet invite link and they register and login to the GroupTweet dashboard with either their personal Twitter account, Email address, or Facebook. If contributors have Twitter Two Factor Authentication enabled, they will have no problem, as GroupTweet supports this functionality automatically. Any Tweet sent from the dashboard is just like any other Tweet from your account. The dashboard allows members of your group to participate even if they don’t have their own personal Twitter accounts. Just have them register to join your group with their email address. This is where the real magic happens! Contributors can Tweet from the group account directly from their own personal Twitter accounts. No need to even login to the dashboard. Contributors love it, because it requires little to no change in behavior. Contributors can use whichever Twitter application each of them prefers. No need to train or force all users to use Hootsuite or some other application. With GroupTweet contributors can Tweet directly from Twitter.com, any mobile Twitter App, or even from within Hootsuite or Tweetdeck. In the case of the @BreakingNewsGT account, contributors simply include @BreakingNewsGT in their Tweets. 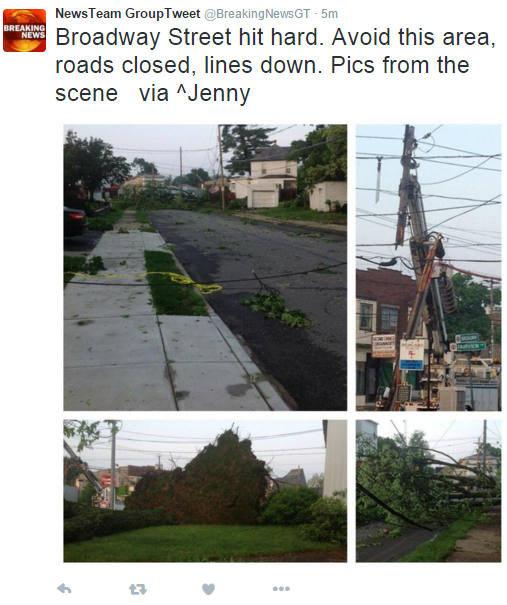 Jenny Wright, an @BreakingNewsGT contributor, logs into her personal account at Twitter.com and sends a Tweet with an attached photo, including @BreakingNewsGT at the end of the Tweet. Easy as that, simply instruct contributers to include @yourgroupname at the beginning or end of their Tweets. You will notice in this example, the contributor’s username has been replaced with her contributor “signature” which is “Jenny”. If you prefer, you can hide the contributors signature so your GroupTweets look just like any other Tweet from your account. Simply edit your “Tweet Template” settings and select “Message Only”. Hashtag GroupTweeting is great, because you can choose any hashtag(s) you want for your group. If your group is using hashtags already, there is literally no changed behavior required. This is a great way to organize and curate all of your contributor’s Tweets under a single Twitter account. Contributors simply include your chosen hashtag in their Tweets. 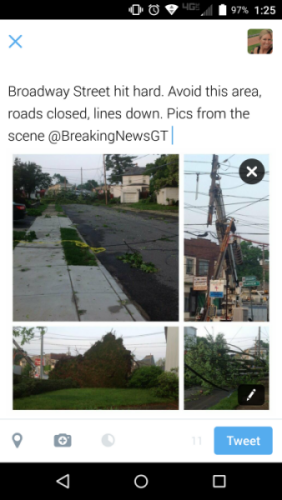 In this example, @BreakingNewsGT has chosen the hashtag #breaking to serve as their GroupTweet trigger. 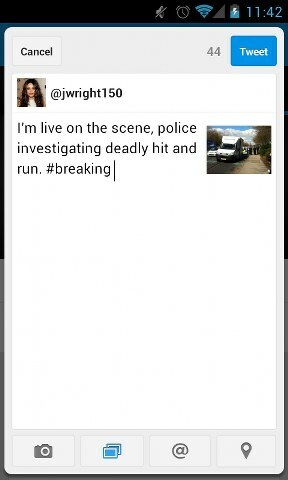 @Jwright150 Tweets a photo from her phone and includes the hashtag #breaking. As you can see above, contributors can Tweet directly from their phones, using the standard Twitter App, Tweetbot, or any other Twitter App you prefer. 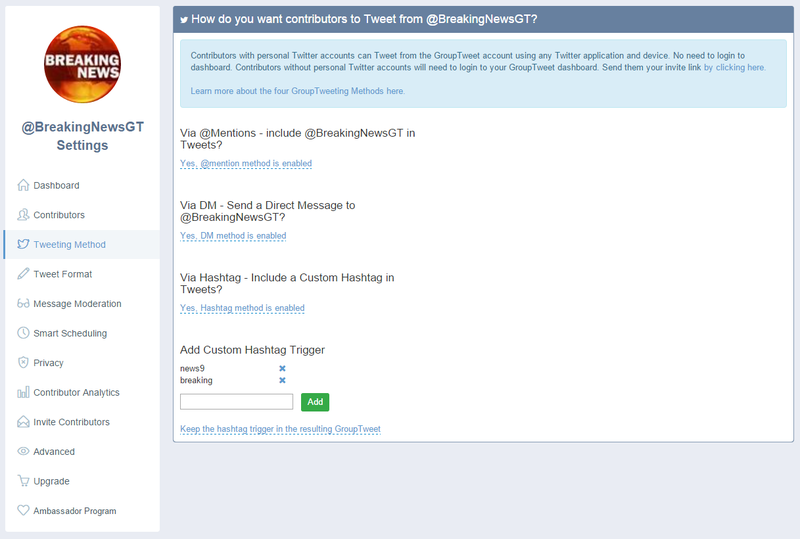 GroupTweet converts the contributor’s message into a Tweet from the @BreakingNewsGT GroupTweet account. In this example, you can see that the contributors username is linked to their actual Twitter account. This is a great way to highlight the members of your organization and allow your followers to visit their personal profiles if desired. The Direct Message (“DM”) method is perfect for setting up Private Group Twitter accounts or when you do not want the Tweet to show up on the contributor’s account too. Contributors simply send a DM to the GroupTweet enabled account. In this example, @WidgetSalesTeam has set up a private communication channel for their sales people to communicate on the go. This allows them to create a private Twitter based message board instead of clogging up email inboxes with annoying reply-all email chains. This Private Direct message was sent straight from the phone of a saleswoman, @jwright150. Her Twitter timeline is public, however you won’t see this message anywhere on her timeline or in Twitter Search because it was sent via Direct Message. Her message is then Tweeted from the private Group Twitter account for only the rest of her approved colleagues to see. If you haven’t already connected your company, group, or organization’s Twitter account with GroupTweet, what are you waiting for? Go ahead and navigate over to GroupTweet and get started! when a contributor tweets from his personal account what happen to the picture , does it re-upload in the main account or only copy the link from the contributor personal account ? Greetings. Seems like when I groupTweet from the dashboard, it includes my complete email address (via ^carrie.heeter@gmail.com), whereas when I DM, it does what I want to happen, which is to use my signature (via ^ch). Preferred because of the limited characters in a tweet. How do I set up the tweet template to always use the signature, not the email? Oh, nevermind. I was logged in as the grouptweet. The preview showed my full email, but when I clicked Send, it switched to ^sgdcert (the grouptweet twitter). My confusion. I know what’s needed now. Thanks. Such a cool tool! HOW THE HELL CAN I REMOVE MYSELF FROM THIS ANNOYING GROUP TWEETING CRAP? I WANT OUT!!! 1st – no need for all caps. 2nd – What specifically is annoying you? Perhaps Group DMs or how Twitter group’s replies? I imagine not grouptweet accounts as you can simply choose to deactivate your grouptweet account if so. Contact support@grouptweet.com with specific questions. Please…HOW do I “deactivate” (remove myself from) Group DMs? GroupTweet has nothing to do with Twitter group dms. But I’ll still help you. In your Twitter app when viewing the group dm. Simply click settings view then “leave conversation”. Easy as that.